This week presented another first for me. We had birthdays for one of our sons and one of our daughters this week. As part of our daughters birthday she had been given a gift which was an unexpected surprise. One of the patients who visit the dentist, where she works had brought her 2 brace of pheasant, what a very kind man! As a result, this gave me the opportunity to pluck and prepare the 4 birds for the freezer, for the very first time. I watched a couple of youtube videos, as you do and after only an hour and a half I was all sorted. I know, I surprised myself! A few weeks ago I accidentally dropped my torch into the ditch rendering it useless, at the time I never realised how dropping it would come back to haunt me, but this week that’s exactly what it did. 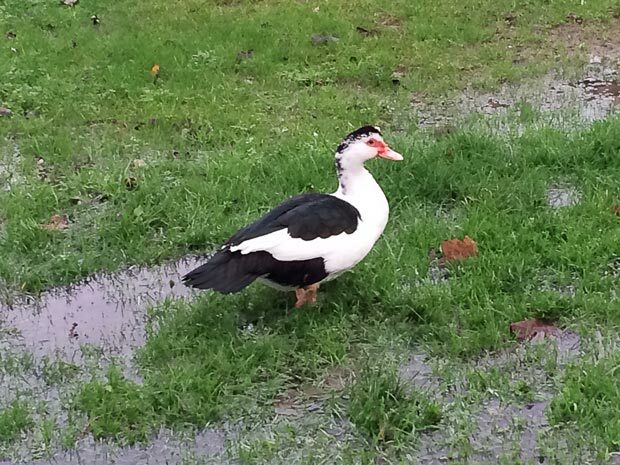 For months we have been losing our Muscovy ducks as many have disappeared without trace. Although we have a range of suitable homes available for them, they have always preferred to roost outdoors in the trees, on the stable roof. We have suspected for some time that they have been taken by a fox, but also considered that other predators could also have taken them or they have all just flown away. Up to this point we have never had any proof either way but this week that all changed. As I start my rounds each morning in the dark, Tuesday was much the same as any other day. After dealing with all the farm animals I made my way back to the house to pick up the 3 dogs to take them out for a run. As the sun had risen by this time, I was able to see in full technicolor what was greeting me on the lawn beside the house. The sight that welcomed me left no doubt in my mind that Mr. Fox had come calling and had caught our ducks off guard. The remains of one of our remaining 3 ducks was strewn across the lawn and our second male was missing and hasn’t been seen since, leaving only our little female to tell the tale of the night before. Following the traumatic goings on of that night, we have, as a matter of course been coaxing our remaining duck into the barn for safe shelter. That in the main hasn’t been too arduous a task, until last night, the night that it absolutely poured down. Darkness had fallen, the rest of the animals were locked up for the night, which left only our solitary duck with her head under her wing, standing on one leg, roosting on the fence between sheep fields. So, I waded through the flooded field to try and take her off the fence. Unfortunately, on this night Miss Duck was in no mood to be taken quietly, which was never going to be a good thing on a dark night, without a torch. She then spent the next 30 minutes giving me the run around. All I could see was a faint white blurr, flying from fence to fence, each time deciding to shift herself whenever I got close to her. It was like she was determined to visit as many of her neighbours as she could, whilst making things as difficult as possible, for me. Eventually I got her to fly back into the farmyard where I could calmly, without any sudden movements, walk her into the barn for the night. Guess what I purchased later that eventful evening?